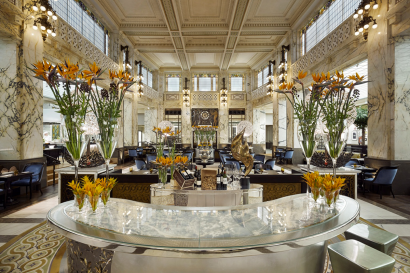 Originally constructed between 1913 and 1915 as the headquarter and later serving as the headquarters of the Lower Austrian Escompte Bank, Park Hyatt Vienna occupies this 100-year-old building. 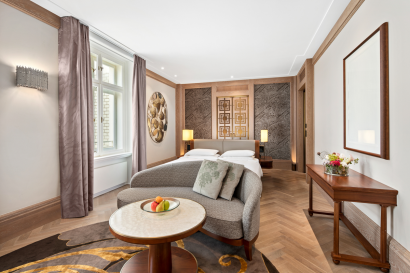 Situated in Vienna’s renowned Innere Stadt and the new “Goldenes Quartier” at the square Am Hof, Park Hyatt Vienna forms part of Vienna’s First District, listed as a World Heritage Site by UNESCO. Am Hof is the largest and oldest square in the inner city of Vienna. The square is dominated by the white Baroque facade of the Kirche am Hof, an originally Gothic 14th century church. The history of the square goes back to the Roman era, when a garrison was built here. In the 12th century the Babenberg duke Henry II Jasomirgott built a castle on the Roman foundations. The castle was the residence of the dukes of Austria from 1156 until 1220. The square in front of the castle was first used for jousting tournaments and later became a market square. The church next to the building was founded in 1386 by the Carmelite order. The facade of the Gothic church was rebuilt in 1662 by the Italian architect Carlo Carlone. In 1806, after Napoleon had occupied Vienna, the end of the Holy Roman Empire was declared from the balcony of this church. In front of the church stands the Marian Column. The column was commissioned by the Holy Roman Emperor Ferdinand III to thank Mary for repelling the Swedish forces during the 30 Years’ War. The column was built between 1664 and 1667 after a design by Carlo Carlone. The black column, topped with a statue of the Virgin Mary, is surrounded by four cherubs clad in armour. The cherubs fight against a lion, a serpent, a dragon and a basilisk representing war, heresy, hunger and the Plague. 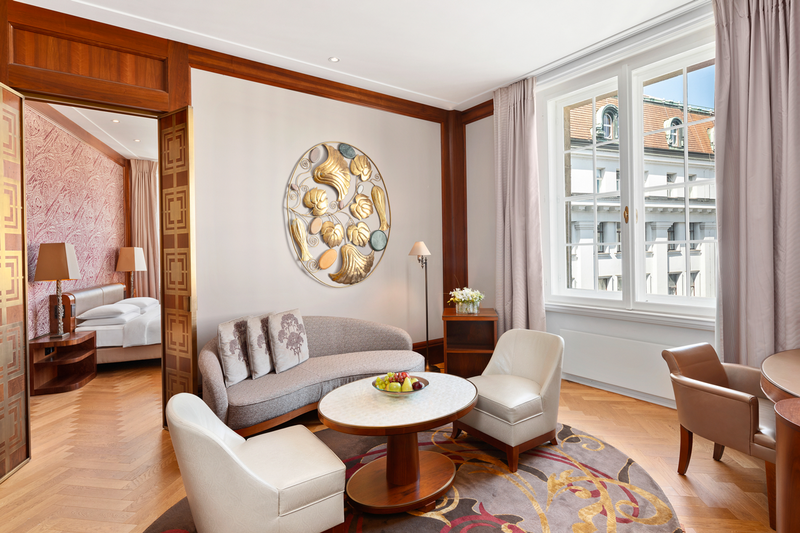 The central location and close-by sights, make Park Hyatt Vienna the ideal starting point for various activities, business and leisure travelers alike. For guests looking to experience and explore everything Vienna, the hotel is located in the heart of the most exclusive shopping district in Vienna, just steps away from the celebrated fashion houses and boutiques of Kohlmarkt. The imperial city of Vienna offers a variety of cultural, contemporary and culinary activities. Influenced by its history, the city presents various museums, art galleries, theatres and operas. With flagship stores of well-known luxury brands, as well as alternative boutiques of local designers, Vienna offers unconventional and high-class shopping for everybody. 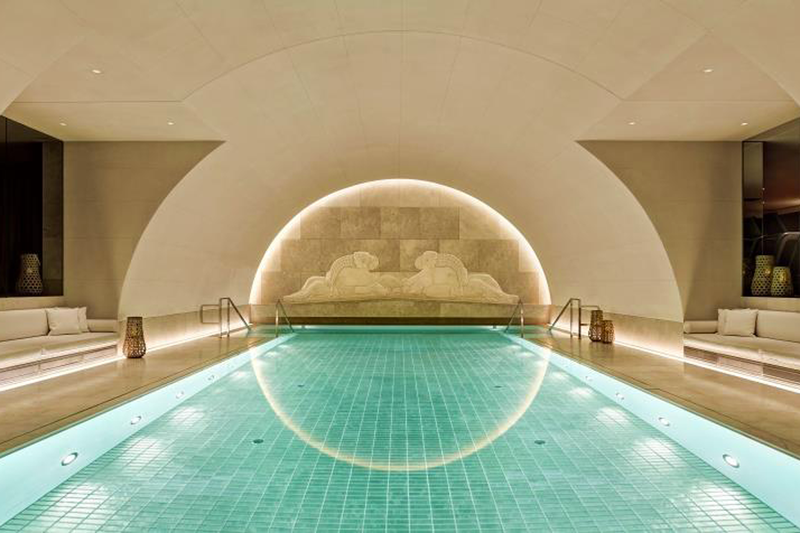 Located in the former vault of the bank, the 15 metre long and 6 metre wide swimming pool, on the lower basement of Arany Spa, offers relaxation and fitness. After a few laps in the pool with the golden tiles, shaped like golden bars, guests can enjoy an extensive wet area with sauna, steam room, sanarium and vitality shower. Staying in Vienna with kids allows you to spend time together, because the city offers a wide range of exciting activities for you and your family. Some of our most important guests are also the smallest. Our V.I.B. (Very Important Baby) Program makes sure our junior guests are just as pampered as the grown-ups. 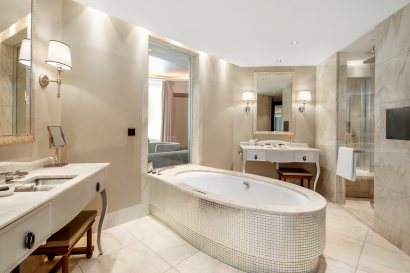 The fun includes a present waiting in their room, child-friendly amenities and a baby cot if required. Toys, a temperature tester and plenty of bubbles – everything you need for bath time fun. When it’s time to say goodnight, your little one can snuggle up with our special Park Hyatt Vienna soft toy and enjoy a good night sleep in a special arranged kids bed. Children can curl up in their very own bathrobe and slippers, playing board games or watching movies. We can arrange a variety of comics, books and kids DVD’s. • Guest rooms are amongst the largest in the city, ranging in size from 35 sq. m. to 170 sq. 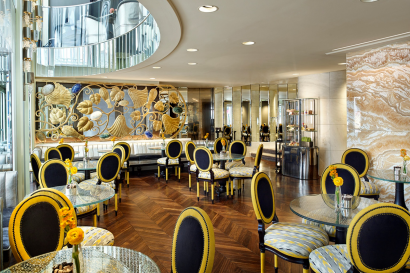 m.
Located in the centerpiece of the building, with its own entrance from Bognergasse, The Bank Brasserie presents an exceptional dining experience in a warm sophisticated atmosphere. Focusing on newly interpreted brasserie classics, using sustainable locally sourced products, we serve a daily buffet breakfast, a Plat du Jour menu and A la carte lunch as well as dinner. The open show kitchen allows diners to watch and follow the chefs preparing tasty menus using high-quality products. For business or private occasions, The Bank Brasserie provides a Private Dining Room for up to 12 persons, offering an exclusive atmosphere. The Chefs Table, located between the two show kitchens, serves a family-style menu for up to eight diners, prepared and served with personal care by the chef de cuisine. The Bank Bar presents specially created international premium cocktails based on sensorial and optical associations with the former cashier hall and materials like wood, leather, metal and copper – reminiscent of a time when the building used to be a bank. Accessible from the hotel lobby as well as through a separate entrance, the authentic Café Am Hof is a modern venue, with floor-to-ceiling windows that provide a charming view out onto the Bognergasse. Inspired by charming Viennese coffee houses of the 19th century, the Boutique café provides the perfect meeting point at all times of the day. From a Wiener Melange to home-made cakes to a small breakfast or a quick snack – the choice is infinite. All food and beverage items, cakes and sandwiches are also available for take away. 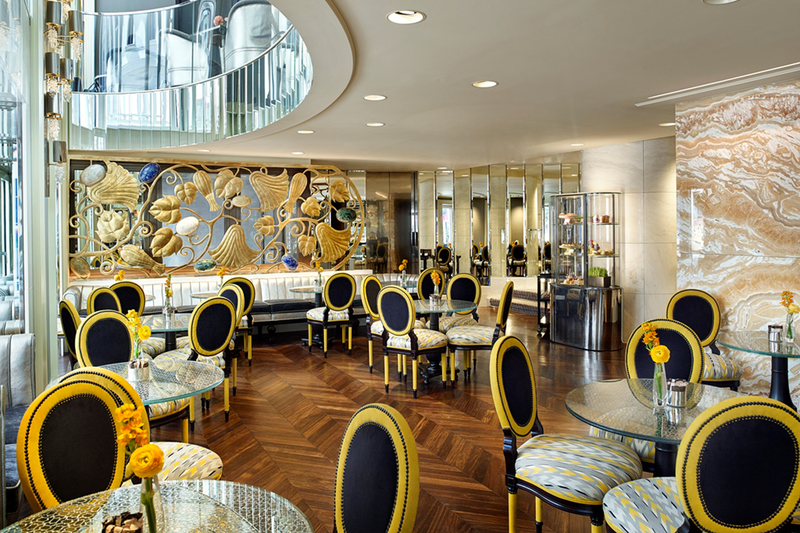 The Lounge is the perfect place for an afternoon tea or a quiet drink before dinner. A light color concept creates a feminine atmosphere, while vibrant art complements the inviting space, making the guest feel at home. 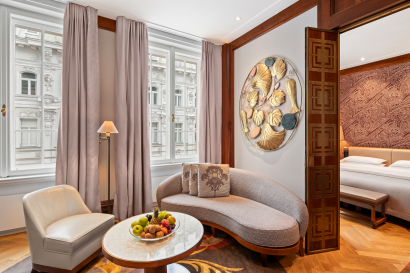 In this relaxing atmosphere, you can enjoy a small Viennese breakfast and delicious Viennese pastries in the morning. In the evening, you can indulge in a refined selection of wines and champagnes in a comfortable ambience or have a small dinner. 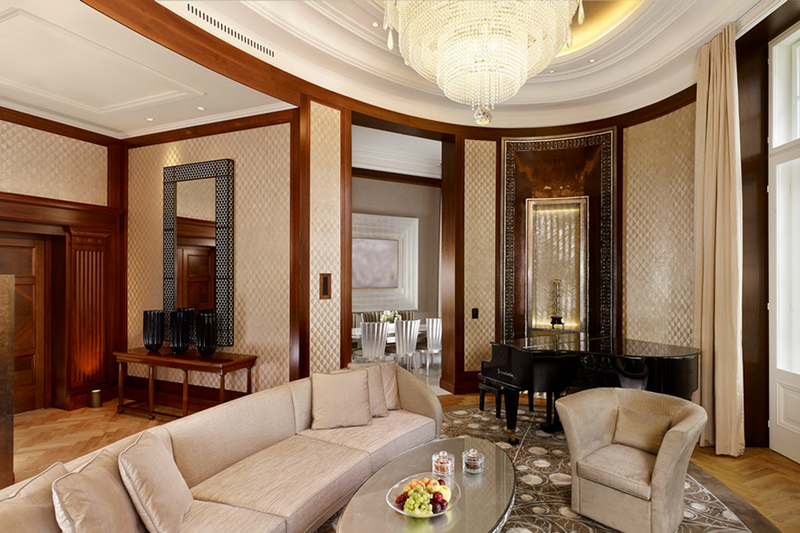 Adjacent to the hotel lobby as well as accessible from the Lounge, you will find the Living Room. 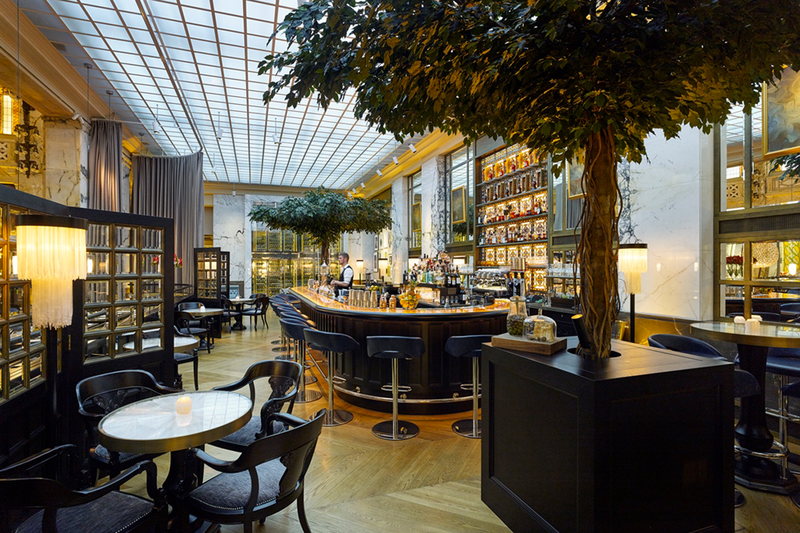 Feel at home, relax and enjoy a large selection of aged and refined spirits along with other premium liquors. Special lockers provide private whiskies with safe storage. 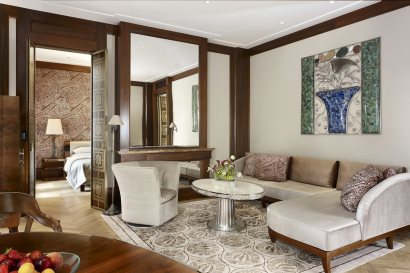 Lean back and experience the outstanding ambience in the beautifully restored wood paneled lounge and its cozy armchairs and sofas. The Living Room offers you an authentic space to enjoy a cigar from our various collection, stored in the walk-in humidor, together with exceptional spirits. Viennese pastries and small bites are also available. Arany Spa – the ultimate luxury wellness experience. The spa at our hotel will spoil you with a 15m indoor swimming pool, a wet area including sauna, steam bath, sanarium and vitality shower. 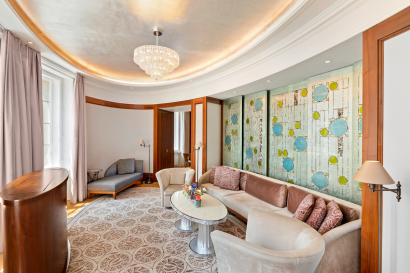 Find the ideal place to unwind and de-stress at Arany Spa after a full day in the city of Vienna. Arany Spa features six spacious treatment rooms including one couples treatment room, each designed to relax and unwind with various massages, cosmetic and beauty treatments on offer. At the Spa in our hotel in Vienna guests can also take advantage of the extensive fitness centre hosting advanced technology from Technogym. To meet the requirements of business or social events, Park Hyatt Vienna offers 800 sq. m. of premier meeting space in beautifully restored historic rooms, for up to 200 people. 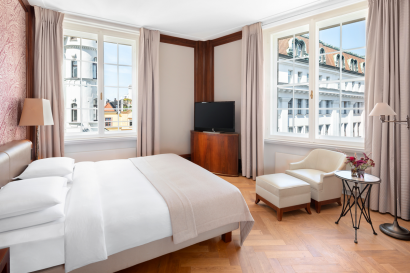 All meeting venues or our Vienna conference hotel are equipped with wireless Internet connectivity, permanently installed screens of 70” and 80” as well as the latest audiovisual equipment. All eight meeting rooms, as well as the Grand Salon have access to the 100 sq. m. prefunction area and offer natural daylight. The catering at our conference hotel in Vienna also leaves nothing to be desired, from creative coffee breaks to special menus.